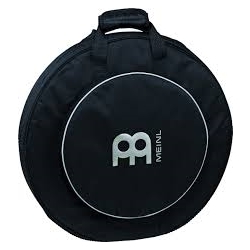 Meinl MCB22-BP Professional Cymbal Pack, keep your cymbals safe.. The Meinl 22" Cymbal Bag has two backpack straps on the backside for easy transportation. This bag also includes an external hi-hat/splash compartment which holds cymbals up to 15" in diameter. A glow-in-the-dark Meinl logo is placed on the outside for spotting your bag in darkly lit venues.